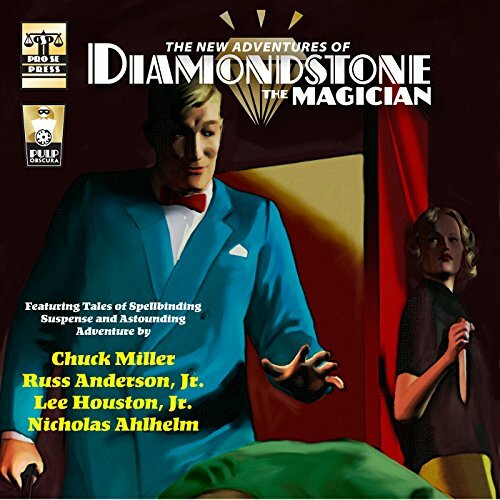 There's a full house...The lights are dimmed...The audience is seated… and the best seat in the house is saved for You in the Front Row for THE NEW ADVENTURES OF DIAMONDSTONE THE MAGICIAN from Pulp Obscura by Pro Se Productions, now a top quality audiobook produced by Radio Archives! Created by master Pulp author G. T. Fleming, Diamondstone the Magician was a seasoned sleight of hand artist and stage illusionist who dabbled in the investigation of crime as an amateur detective. Aided by his friend and assistant, Absalom, Diamondstone uses his skills, tricks, and wits to confound, confuse and capture criminals who believe that they can outsmart justice using smoke and mirrors! From out of the past comes New Tales of the Magician Sleuth written by Chuck Miller, Russ Anderson, Jr., Lee Houston, Jr., and Nicholas Ahlhelm! Watch as Diamondstone gives some of his finest performances ever as he steps into the spotlight to solve strange cases and exciting new mysteries in THE NEW ADVENTURES OF DIAMONDSTONE THE MAGICIAN from Pulp Obscura! THE NEW ADVENTURES OF DIAMONDSTONE THE MAGICIAN is available at Amazon and www.prose-press.com.